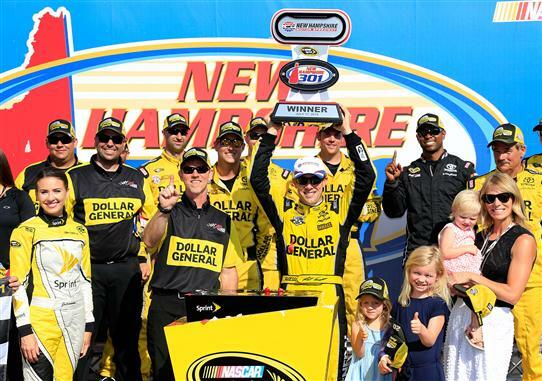 LOUDON, N.H. – In a race that saw many of the usual suspects go into hiding in the closing laps, Matt Kenseth battled to the front of the field from the 18th starting position and pulled away after a late restart to win Sunday’s New Hampshire 301 at New Hampshire Motor Speedway. Winning for the second time this season and for the third time at the Magic Mile, Kenseth crossed the finish line 1.982 seconds ahead of Tony Stewart, who solidified his position in the top 30 in the NASCAR Sprint Cup Series standings – and therefore in the Chase – with the runner-up finish. Kenseth, who recovered from an early glitch on pit road after his No. 20 Joe Gibbs Racing Toyota was blocked in its stall, took the lead from Kyle Busch on Lap 271 of 301 and held it the rest of the way, despite three subsequent cautions and restarts. “Every restart you’re just hoping not to mess up and spin the tires too bad,” Kenseth said. “Thankfully, we had good ones, and we had great power, and we had good traction, and we were able to get going pretty good in a straight line. Joey Logano took third place by .019 seconds in a drag race against Kevin Harvick. Greg Biffle ran fifth followed by Jamie McMurray, Ryan Newman, Kyle Busch, Denny Hamlin and Ricky Stenhouse Jr.
That cast of characters didn’t include Martin Truex Jr., who led 123 laps before breaking his shifter and losing the clutch, keeping his No. 78 Toyota stuck in fourth gear. It didn’t include pole winner Jimmie Johnson, who repeatedly lost ground on restarts and came home 12th. It didn’t include Kurt Busch, who ran in the top five most of the afternoon but ultimately was knocked out by contact from the No. 88 Chevrolet of Alex Bowman, who finished 26th in a substitute role for ailing Dale Earnhardt Jr. It didn’t include 2014 New Hampshire winner Brad Keselowski, who, like Kurt Busch, had a contending car for most of the day but cut a tire in a late four-car wreck that caused his two-race winning streak end in a 15th-place finish. It didn’t include Carl Edwards, whose No. 19 Toyota was damaged in the four-car Lap 285 chain-reaction wreck that caused the seventh and final caution. And even though Kyle Busch held eighth place in the late going, his finish was disappointing. Busch led a race-high 133 laps and restarted third with 11 laps left, but lost ground in a fight for fifth with Biffle and dropped two more spots thereafter. Stewart, however, was delighted with the effort of his team. He and first-year crew chief Mike Bugarewicz exchanged texts dealing with setup notes on Saturday night, after Stewart flew to Ohio to oversee the Kings Royal sprint car race at Eldora Speedway, which he owns. When he returned to Loudon for Sunday’s race, his No. 14 Stewart-Haas Racing Chevrolet was markedly better than it had been in Saturday’s two practice sessions. “Yeah, we had a much better Haas Automation Chevy today than what we had yesterday,” said Stewart, who is now 67 points ahead of 31st-place Brian Scott. “Buga (Bugarewicz) did a really good job. I went off and went to Eldora for the Kings Royal last night. Getting his opportunity to drive the No. 88 Chevy when Earnhardt was sidelined with concussion-like symptoms, Bowman had a top-10 run going until contact with Edwards’ Toyota on pit road started tire issues that culminated in Bowman sliding into Kurt Busch’s car in Turn 3 on Lap 271. The right front tire went completely flat on the frontstretch, sending Bowman into the outside wall. Though the accident knocked the speed out of the car, Bowman was able to stay on the lead lap. The spate of late cautions also gave Logano a chance to move forward.